The Metro Regional Connector Project extends from the Metro Gold Line Little Tokyo/Arts District Station to the 7th Street/Metro Center Station in downtown Los Angeles, allowing passengers to transfer to Blue, Expo, Red and Purple Lines, bypassing Union Station. The 1.9-mile alignment will serve Little Tokyo, the Arts District, Civic Center, The Historic Core, Broadway, Grand Av, Bunker Hill, Flower St and the Financial District. This new Metro Rail extension will also provide a one-seat ride for travel across Los Angeles County. From the Metro Gold Line, passengers will be able to travel from Azusa to Long Beach and from East Los Angeles to Santa Monica without transferring lines. The Regional Connector will improve access to both local and regional destinations by providing continuous thru service between these lines and providing connectors to other rail lines via the 7th St/Metro Center Station. The new Metro Rail extension will offer an alternative transportation option to congested roadways and provide significant environmental benefits, economic development, and employment opportunities throughout Los Angeles County. The Regional Connector Project receives partial funding from Measure R, which is a half-cent sales tax increase approved by voters in 2008. The Regional Connector Transit Project will greatly improve connectivity across the region’s transportation network and welcome residents and tourists alike to three distinct districts within Downtown Los Angeles. Read more about each destination below. The Little Tokyo/Arts District Station, currently an at-grade Gold Line station located at the intersection of 1st and Alameda streets, will be moved underground and across the street to the southeast corner of 1st St and Central Av as part of the Regional Connector Transit Project. The station, bordering the two neighborhoods of Little Tokyo and the Arts District, will make these historically rich and vibrant neighborhoods easily accessible. As one of the three remaining Japantowns in the United States, Little Tokyo offers a unique cultural experience for the whole family. This Gold Line destination introduces the public to traditional and contemporary Japanese culture through vibrant festivals, historical tours, exhibitions, performances and more. This neighborhood lies within a nationally recognized historic district and has been an important piece of LA’s history since it’s beginning. Walk down the brick-lined streets and explore small family owned businesses offering authentic cuisines and one of a kind retail. The neighborhood's local museums and cultural centers are the heart of this community and present unique artistic and cultural programming to the visitors every day. Since the 1970’s, this once gritty industrial district has evolved to an urban destination with arts at its roots. Galleries, small boutiques, socially conscious retailers, breweries and restaurants, lie amidst a stretch of early 20th-century warehouse lined blocks that introduce passersby to murals by local and international artists. Visitors can walk south just a few blocks from Metro’s Gold Line’s Little Tokyo/Arts District station and decide upon a guided historical tour, view street art, visit a contemporary gallery, take a hike to a local breweries, shop at an arts’ inspired boutique, or bring the family to the Saturday Farmer’s Market. With the Regional Connector’s direct connection across Los Angeles County, residents from Azusa, Santa Monica, East Los Angeles and Long Beach will easily access downtown Los Angeles’ Little Tokyo and Arts District communities contributing to the thousands of visitors flowing each day into these two neighborhoods. The rich history of the birth of downtown Los Angeles surrounds the location of the new Historic Broadway Station. The streets of historic downtown Los Angeles include two nationally registered districts: The Broadway Theater District, which includes the remnants of 12 theaters within seven blocks, and Old Spring Street, which is known as the original Financial District of Downtown Los Angeles. Broadway is one of the oldest streets in the city and it was laid out as part of the 1849 street plan. Broadway was also the home to streetcars, which were heavily utilized by shoppers and workers between 1901 and 1963. The Historic Core Downtown and the Civic Center areas combined contain the second largest concentration of government employees in the United States outside Washington, D.C. The new station will be the hub for both government employees and tourists alike. With the connectivity to downtown, a visitor can hop on the train and go to the Grand Av Arts/Bunker Hill Station to visit the cultural hub of downtown Los Angeles or to the Little Tokyo/Arts District Station to visit historic Little Tokyo. With the Regional Connector’s direct connection across Los Angeles County, residents from Azusa, Santa Monica, East Los Angeles and Long Beach can easily access downtown Los Angeles’ government services or nearby destinations. The new Grand Av Arts/Bunker Hill Station will sit a block west of Grand Ave surrounded by nationally recognized performing arts centers and museums. Besides these cultural assets, the area remains a job and residential center for thousands of Angelenos. The area traditionally known as Bunker Hill draws thousands of local visitors, as well as tourists from all over the world. Bunker Hill has a rich history from its inception in 1867 and its revitalization, beginning in 1955, which populated Bunker Hill with modern plazas and buildings. The resurgence of Bunker Hill in recent years grew from the construction of public venues, such as the Walt Disney Concert Hall , the Museum of Contemporary Art and more recently, The Broad Museum. With the completion of the Regional Connector’s Grand Av Arts/Bunker Hill two-story station, visitors can hop on the train and exit at the footsteps of these popular venues. With Regional Connector’s direct connection across Los Angeles County, residents from Azusa, Santa Monica, East Los Angeles and Long Beach can easily access Downtown Los Angeles’ cultural hub and surrounding destinations. The 7th St/Metro Center, one of the most utilized Metro Rail stations, serves thousands of workers in the Financial District. With the completion of the Regional Connector, the 7th St/Metro Center will no longer be a terminus for the Long Beach Blue Line and the Culver City Expo Line but will offer an opportunity to save 20 minutes for those commuting by rail across Los Angeles County. 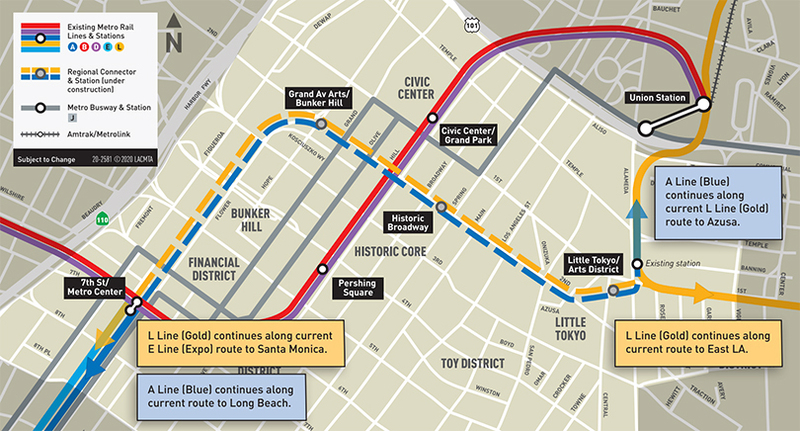 The Regional Connector will also relieve station crowding with its direct access to centralized stations such as Little Tokyo/Arts District, Grand Av Arts/Bunker Hill and Historic Broadway. With Regional Connector’s connection across Los Angeles County, residents from Azusa, Santa Monica, East Los Angeles and Long Beach can easily access downtown Los Angeles’ Financial District and surrounding destinations. Deck panel installation on 1st St in Little Tokyo. Third party work: Utility relocation in Little Tokyo. Yard maintenance on 1st St, between Rose and Alameda St, in downtown LA. Excavation activities on Flower St between 6th St and Wilshire Bl in downtown LA. Utility surveying on Alameda St, between 1st St and Temple St, in downtown LA. Utility work at 6th and Flower St intersection in downtown LA. Geotechnical instrumentation maintenance at 2nd St/Spring St in downtown Los Angeles. Equipment mobilization at 5th and Flower St in downtown LA. Paving on Alameda St, between 1st and Temple St, in downtown LA. Utility work at the 2nd St/Spring St intersection in downtown LA. Deck panel removal and excavation on Flower St in downtown LA. 03/07/2019 Utility investigation on Alameda St, between 1st and Temple St.
Utility investigation on Alameda St, between 1st and Temple St, in downtown LA. Paving for utility installation in downtown LA's Financial District. 02/21/2019 Geotechnical Repair at 2nd and Los Angeles St.
Geotechnical repair at 2nd and Los Angeles St in downtown Los Angeles. Geotechnical device maintenance on 2nd St, from Main to Spring St, in downtown LA. Storm drain install on 2nd St in downtown LA. Construction activities at the 1st/Central, 1st St, and Mangrove Yards in downtown Los Angeles. Deck panel removal on Flower St in downtown LA. Geotech device maintenance at 2nd and Spring St in downtown LA. Geotech device maintenance on 2nd St in downtown Los Angeles. Deck panel removal for excavation on Flower St in downtown Los Angeles. Deck panel removal and replacement on Flower St in downtown Los Angeles. Storm drain inspection at Alameda St in Little Tokyo. Sidewalk restoration on Flower St in downtown LA. Geotech device maintenance on 2nd and Spring St in downtown LA. Traffic lane black stripe removal on Flower St, between 4th and 5th St, in downtown LA. Utility investigation for communication line on 1st St in Little Tokyo. Beginning October 25. Communication utility work on Flower St, in downtown LA. Beginning October 22, 2018. 05/08/2017 Excavation Continues on Flower St. between 4th St. and 6th St.
Review the real-time map and longer term street impacts. Beginning Monday, June 8, 2015 the bus stop at the 3rd St/Flower St intersection will be relocated to the south east corner of 3rd St/Hope St.
Metro and other elected officials celebrate the groundbreaking of the Regional Connector.